Japanese contemporary artists are creating some of the most extraordinary and thought-provoking artworks right now. Determined to set their own rules, these prolific inventors have transformed the global art landscape with their uncompromising visions and trendsetting artistry. We have carefully selected 10 iconic artworks by these contemporary artists. You will surely be inspired by the astounding creativity that these pioneers have brought to life! This cutting-edge Japanese artist brilliantly transforms real objects into remembered scenes. Using a thick web of black threads, Chiharu Shiota conjures a hazy cloud around life-size installations, such as this piece In Silence from 2008. The distance this enforces between the viewer and the work recreates the sensation of reaching for a memory that is present but impossible to fully grasp. Shiota moved to Berlin from Osaka in the 90s. Her enormous popularity internationally is warmly celebrated at home, and she was selected to represent Japan at the Venice Biennale in 2015. Check out more of this artist’s fascinating works at chiharu-shiota.com. The iconic pumpkin motif is an insight into a treasured personal experience of this world-famous Japanese artist. This endearing print embodies the importance of creative and personal freedom that came to define her prolific career. You don’t have to be in Japan to enjoy Kusama’s work: check out the 14 Best Places in the World to See Yayoi Kusama's Art! 3. 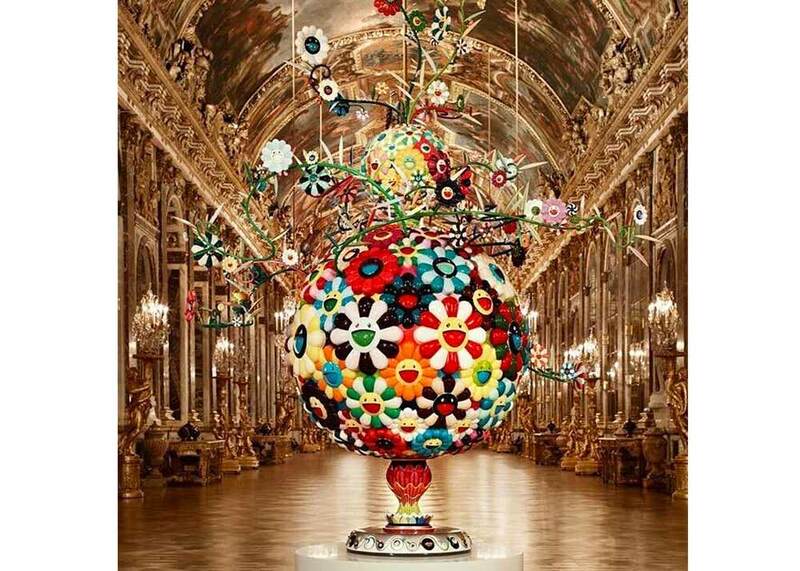 Takashi Murakami's Contemporary Sculpture Takes on Versailles! This energetic sculpture, Flower Matango, seems strangely at home among the 17th century art of the Palace of Versailles. Acclaimed Japanese contemporary artist Takashi Murakami was invited to exhibit at the Palace in 2010, where the baroque backdrop created the perfect setting for his characteristic bold and colorful manga-inspired works. The name of this iron and fiberglass installation refers to a 60s Japanese horror film, where a mutant fungus threatens the world. In Murakami’s anime version, however, the wild floral growth seems to spread only an infectious sense of joy. Taking inspiration from 60s manga and anime, Nara became a refreshing force in the art world during Japan’s Pop Art movement in the 90s. He has since had more than 40 solo exhibitions all around the world. Follow Yoshitomo Nara on Instagram @michinara3 to browse more of his endlessly fascinating paintings and sculptures! Encasing these elaborate flower arrangements in solid blocks of ice transforms a fragile living form into a bold and powerful art sculpture. Conceptual artist Makoto Azuma created this larger than life set as the perfect way to enhance the spring sensations of Dries Van Noten’s Spring/Summer 2017 fashion show. Visit azumamakoto.com for more of his unique botanical sculptures and other artworks. 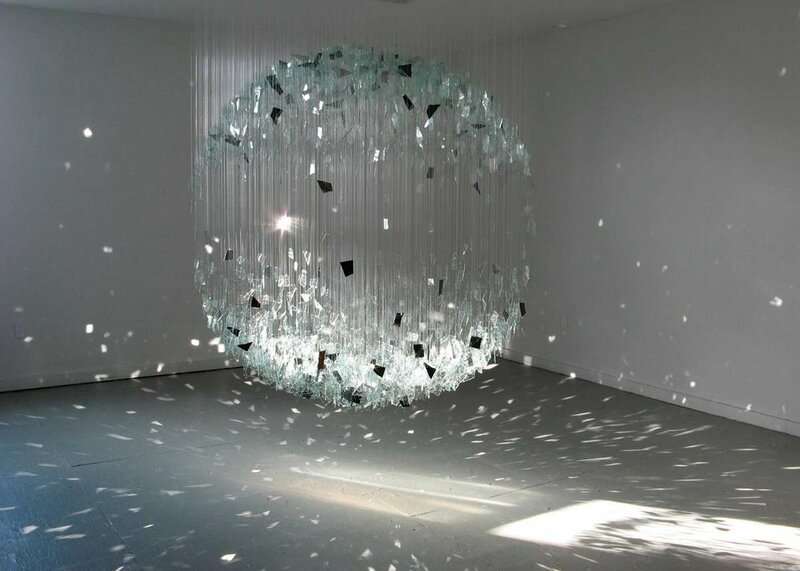 This glittering art installation from Japanese contemporary artist Minako Shirakura captures an instant in time and place. For this one-off creation, Correspondence, Shirakura sourced glass shards from hardware stores in the area of Provincetown, Massachusetts. Suspended in a perfect sphere, they represented an interconnected world, while reflecting and distorting their own surroundings. Shirakura works across various media, check out more of her installations at minakoshirakura.com. Glass is, of course, a material with which Japanese artists excel. For more check out these 10 Brilliant Glass Artists! Kohei Nawa’s compelling Pixcell series recasts both everyday and more unusual objects, revealing them in a new light. By encasing a real deer with glass spheres the artist blurs its macroscopic form, while at the same time clarifying the fine detail of the surface like a mass of focused lenses. Visit Nawa’s site at kohei-nawa.net for more information. Through multimedia artist Miwa Komatsu’s evocative brush, the sacred Japanese lion dogs come to life! Komainu, lion dogs, are the first creatures you encounter when you visit a Japanese temple or shrine. 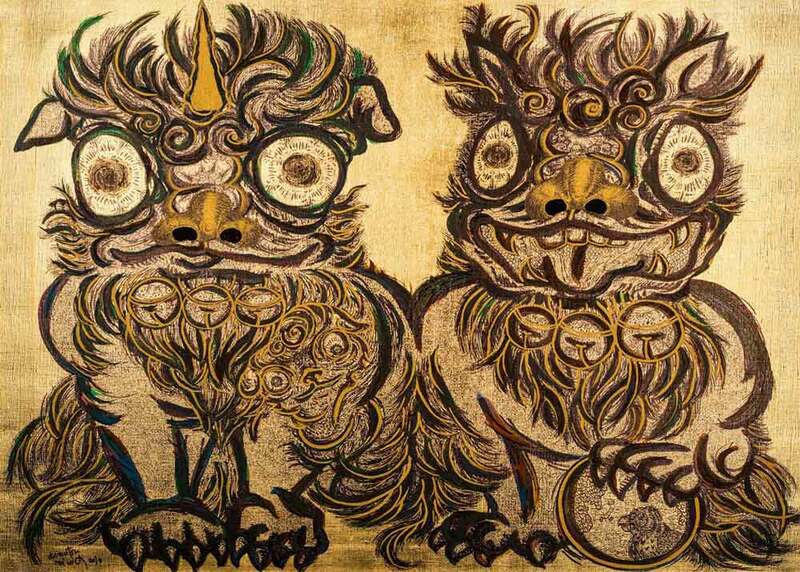 They are the guardians of the spiritual realm and a popular Buddhist deity throughout East Asia. Komatsu’s art centers on the intriguing manifestations of Japanese religion and history. 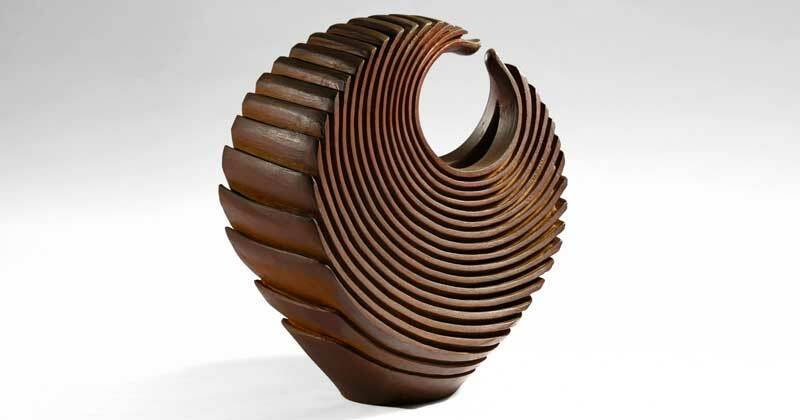 Employing painting, copper print and sculpture, she has created a significant collection of arts that is not only compelling in its own right, but also has a critical role in advocating for Japanese heritage and culture. Check out many more of Komatsu’s fascinating works at her website. If you’ve ever wondered what a journey inside a UFO would be like, Mariko Mori provides an unexpected answer. This smooth-skinned space pod, entitled Wave UFO, was designed to take three intrepid visitors on an experiential journey. An animation created from the participants' brainwaves was projected onto the inner surface, aiming to encourage understanding of their connectedness with each other, and with the world at large. Mori's work blends installation, photography and digital media to offer new ways of seeing. Follow @marikomori on Instagram to find out what this ingenious artist is up to now. Inanimate objects in the natural world have a deep, almost mythical connection with humanity, which we often taken for granted. Master sculptor Nobuo Sekine explores this distinctly Japanese concept, seeking to reveal the truth of things. 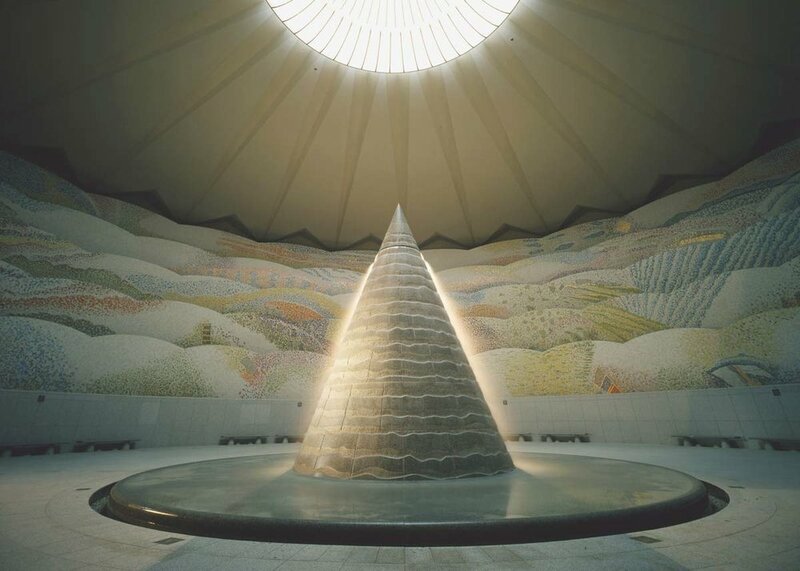 This towering cone standing in Tama Cemetery, Tokyo, is Sekine’s last creation, completed in 1993. He is an avant-garde artist with a fascinating biography. He started the Japanese contemporary art movement ‘Mono-ha’, or the school of things, that reacted against Western consumer culture in the late 1960s and 1970s. With this pyramidal object Sekine’s intention is to create a near Zen-like spatial reality by reducing the excess and limitations of the artist’s judgment. What remain are only consciousness and an acute awareness of the material itself. For more Sekine’s thought-provoking works, visit his official site at nobuosekine.com. Have you visited any of these works? Let us know your thoughts in the comments below!